There are many situations that can arise from a car back-down that can cause garage door spring replacement or a bird nest built over the photo eye sensor. If you are prepared for the situations that can occur you will know how the professionals can help you keep your garage door moving. * Check the Transmitter Batteries: The transmitter requires power to work properly. Batteries are included in necessary garage door repair parts. More than likely you installed the batteries in each transmitter at the same time, so it makes sense they could go out at the same time. Check the batteries every 30 to 60 days. * Misaligned Photo Eye: Photo eyes are located on either side of the garage door. The invisible beam connects one eye to the other. If it is not functioning or connecting properly it can keep the doors from opening. * Misaligned Track: If the track on the door is misaligned it could mean a variety of things. It could be that the door panels have shifted or the metal track needs alignment. Gaps between the rollers can be a problem as well. * Random Opening or Closing: If the door is operating on its own at random times, it could be an issue with the transmitters. Something could accidently be depressing the control mechanism. The transmitter frequency could also be an issue. A garage door professional can check it and get you going again. * Door closing on halfway: If an object is obstructing the invisible laser that allows the door to close it will trigger a reaction and the door will retract. Move all items out of the doors path. 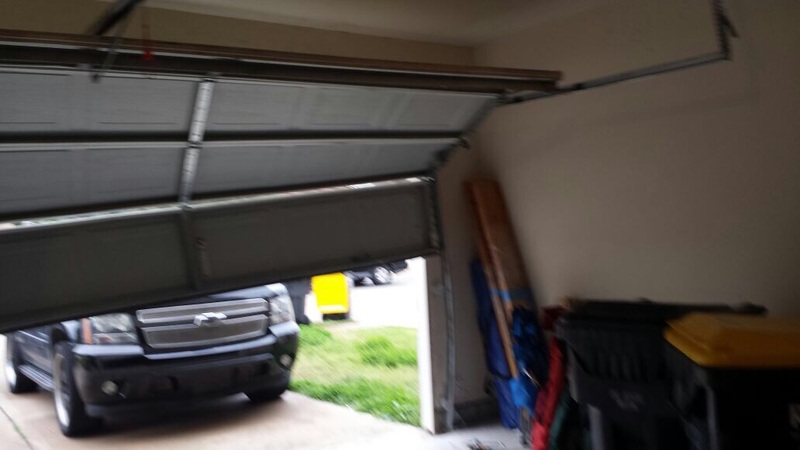 * Door won’t raise: Some garage doors are heavier than you may realize. A broken garage door spring will prevent your door from functioning. Make sure to check the springs for normal wear and tear and breakage and have them replaced when necessary. * Door closes, then opens again: Most likely the open and close settings are off when this happens. Check the operator’s manual for the correct limitation settings of the garage door opener. You may need to repair your opener. * Garage door opener that runs but doesn’t lift door: All openers come with a disconnect switch in case of a power failure. There is a hook that allows manual operation of the door. Make sure it is hooked properly. * Opener comes on a few seconds and then shuts off: You may need to get your motor repaired. This is a common issue in older doors. Sometimes it is as simple as a lock that has been tripped accidently or the motor could be going out. * Door that drops with a bang: Broken tension springs can cause this or a broken cable. Seek help from a professional because these components are dangerous to work with if you don’t have the proper experience or training.